At this point you very much want the piece to exist, to stand on its own, and so you are driven to build. You want it to “turn out” to be what you envision and hope for. Yet in between the compelling vision and the fulfilling object is the potential chasm of disappointment. This, frankly, evokes some fear. He charts an effective course. This is the strategic order of the steps of construction. Will you glue up the wall cabinet case before or after building the doors? He points out the critical junctures where you must bear down and get things right. Those last few plane shavings off the drawer sides greatly affect the fit and feel of the drawer. He alerts you to possible pitfalls, many of them sneaky. How will the figure change when a piece is shaped into a convex curve? He keeps a steady perspective on the big picture of the project, maintaining your faith. Are the little errors you’ve made so far going to significantly affect the final piece or should you not worry about them? The teacher may be another person whose experience you borrow, but in due time (meaning after making your quota of mistakes) you must be your own teacher even as you remain a student. The important thing is to think through the four points listed above. Further exploration of how exactly to avoid that chasm of disappointment in creating a work in wood is a larger topic for another time, but the steps discussed in this series will go a long way to helping your project “turn out” the way you want it to. As you build, there are still small but important decisions to be made because, as noted in the previous post in this series, drawings cannot fully represent the piece. This is much as a musician uses tools such as phrasing, articulation, and tone color to produce his personal interpretation of written music, staying within the fundamental conception of the composer. Thus the music, or the woodworking creation, comes alive. You’ve done it, now it is there. And yes, that is . . . happy woodworking. Best wishes to you as you pursue your ideas! That’s a beautiful piece, Rob. I assume you’ll be talking about your reactions to how the finished work met, fell short of, or surpassed your initial hopes and any surprises along the way. I hadn’t thought of that but it is a good idea. As for surprises along the way, yea. I had started to use figured makore which I really thought would look nice for a mirror but I decided it was a little too glitzy. I think the bubinga has a bit more character for this. I also think I might be sensitive to the makore dust which seemed to be bothering me as I was working with it. 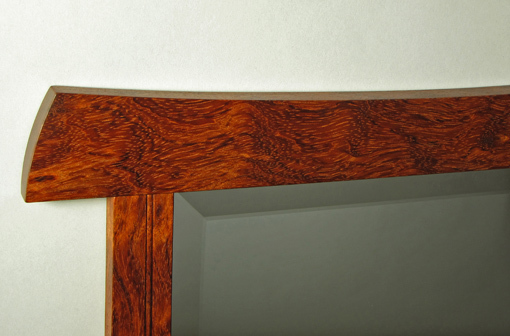 The figured bubinga is tough to work – it can distort after dimensioning, even when the board has sat in the shop for a long while. The shelf is set in a shallow mortise which was a pain to fit but it was the best way to get a nice joint line since the faces of the top and bottom pieces are convex horizontally and vertically. 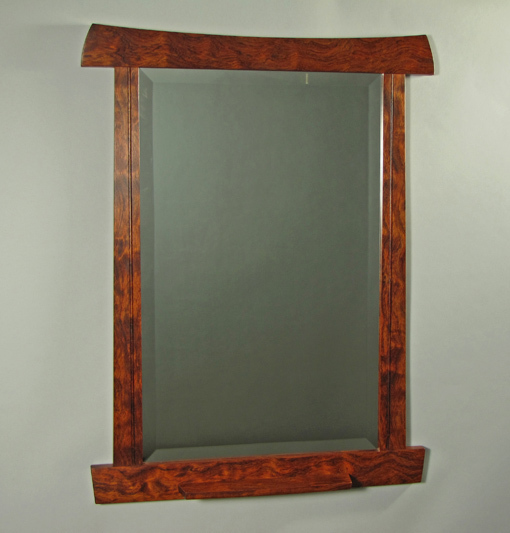 Oh, and I had to send the first mirror back to the factory since the bevels were uneven. Ahh, I could go on. But you know how it is. These projects are always harder than they seem and harder than most anyone is ever likely to know – even a small piece like this. I enjoyed your morror design journey. Weird but I saw alot of information in your answers to commenting woodworkers. This last one above mentioning the uneven bevels and the fact that….”These projects are always harder than they seem and harder than most anyone is ever likely to know”. Thanks, Neil. I greatly appreciate your interest.